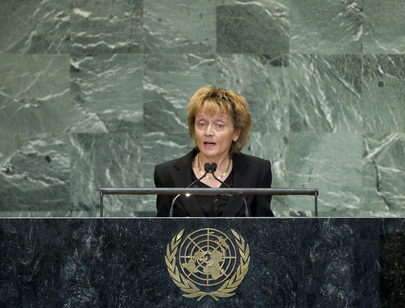 EVELINE WIDMER-SCHLUMPF, President of the Swiss Confederation emphasized the importance of consensus in seeking solutions to conflict situations, saying there should be no recourse to the veto in the Security Council, which was difficult to justify in cases of war crimes, genocide and crimes against humanity. That was why Switzerland and other Member States continued to urge reform of the Council’s working methods, including greater transparency, improved cooperation with other United Nations bodies and more limited use of the veto. Urging all States and peoples to contribute to greater understanding among cultures and creeds, she said freedom of religion or faith must be respected. On the other hand, violent responses to opinions could never be justified, and recent attacks on diplomatic missions were unacceptable and unjustifiable. While applauding United Nations efforts to expand its mediation and preventive-diplomacy capacity, she said more must be done in that regard as most of the Organization’s budget still went to peacekeeping operations. Greater investment in peaceful means of resolving disputes would pay dividends in the long run, she said, emphasizing that every conflict avoided also prevented human suffering and kept development gains from being rolled back. In the past decade, Switzerland had participated in more than 30 mediation processes in over 20 countries. The country regularly made its knowledge and experts available to the United Nations and wished to see that cooperation intensified, she said. Given the current circumstances, mediation was the best way to respond to political realities. As the main instrument of preventive diplomacy, special political missions should be reinforced by creating an appropriate budget framework for them, as well as modalities, financing and support, she continued. When attempts at prevention failed, the United Nations must take decisive action. Switzerland had followed with great concern the worsening situation in Syria, she said, noting that human rights law and international humanitarian law were being flouted as she spoke. Innocent thousands had been killed, hundreds of thousands were trapped, and more than 250,000 had sought refuge in neighbouring countries. Gaining access to injured and traumatized victims, unable to leave, was difficult, if not impossible. Noting that 2.5 million people were in urgent need of humanitarian aid, according to estimates by United Nations organizations, she said her country had set aside more than $15 million for aid to Syria and neighbouring countries. There would be no security as long as human rights continued to be trampled in the most egregious manner, or as long as those responsible believed they were safe from persecution, she said, stressing that they must be held to account. Impunity for offenders was not just immoral; it also compromised post-reconciliation processes and encouraged history to repeat itself. Noting that Switzerland headed a group of more than 30 countries calling for Syria’s referral to the International Criminal Court, she declared: “I call upon you Heads of State and Government present here today, to support this initiative.” The international community must be made aware of the extent of human rights violations in Syria. She said humans were not using the world’s available resources in a sustainable manner, preferring to exploit them for short-term gain. The Rio+20 outcome document provided an opportunity to achieve sustainable development and create a green economy. “We must act today so that future generations do not have to pay the price for our inaction”, she said, emphasizing the need to overcome the mutual distrust and fear that not everyone would be able to compete on equal terms in the green economy. The Green Climate Fund, which would be a key element in financing restructuring, should be set up without delay in an “optimal environment”, she said, citing the availability of Geneva. The transition to the green economy required new approaches, and the common challenge lay in generating prosperity for all without over-exploiting natural resources. In the post-2015 period, everyone could benefit from and build upon the Millennium Development Goals, she said, noting that they provided an opportunity to develop a universal system of targets for the good of future generations. The post-2015 discussions and the Sustainable Development Goals should be combined into a single process.